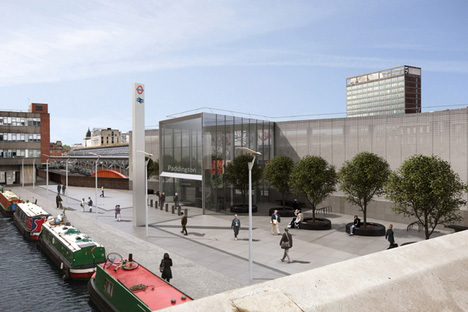 This canalside cube is the proposal for Paddington's Crossrail station. Not as fun as the shark-inspired design at Canary Wharf, though perhaps better for it. The station will sit atop what is currently Paddington's Hammersmith & City line concourse, which would be demolished to make way for the Crossrail behemoth; it's uncertain from these images whether trains on the "Hammercircle" line heading eastbound would still make a stop here, or if passengers trying to get to Paddington would be obliged to get off at Edgware Road and double-back on themselves. In addition to serving Crossrail, the station provides access to mainline and Underground platforms. It has solar panels on the roof (should be enough to power the lights for a weekend in July), and boasts a nicely-scrubbed public square outside. More pictures of the design over at Architects' Journal.